The brand portal that keeps your assets safe | Lucidpress . ', failHtml: "
Every brand asset, one central location. Make everything that defines your brand easily accessible and protected. Why use a brand portal? Dropbox, Google Drive, outdated and complex digital asset management systems-- they all promise to help distribute your brand assets and keep your marketing and sales teams on brand. But between duplicated files, old logos downloaded and stored on local hard drives, and technology learning curves; many employees still create rogue content on a regular basis. The Lucidpress brand portal overcomes these challenges by not only keeping all of your brand assets in one place but also offering a single platform for both storing assets and creating, approving and distributing content. ✓ Maintain brand consistency by ensuring every team member has access to the most recent brand assets. ✓ Keep all of your approved brand images, fonts, colors and style guidelines in one central location. 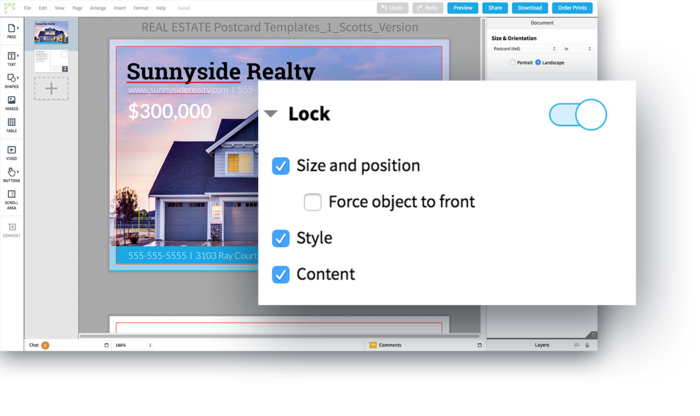 ✓ Create lockable branded templates, so users can create and publish customized content without stretching logos, using incorrect fonts or creating unappealing layouts. 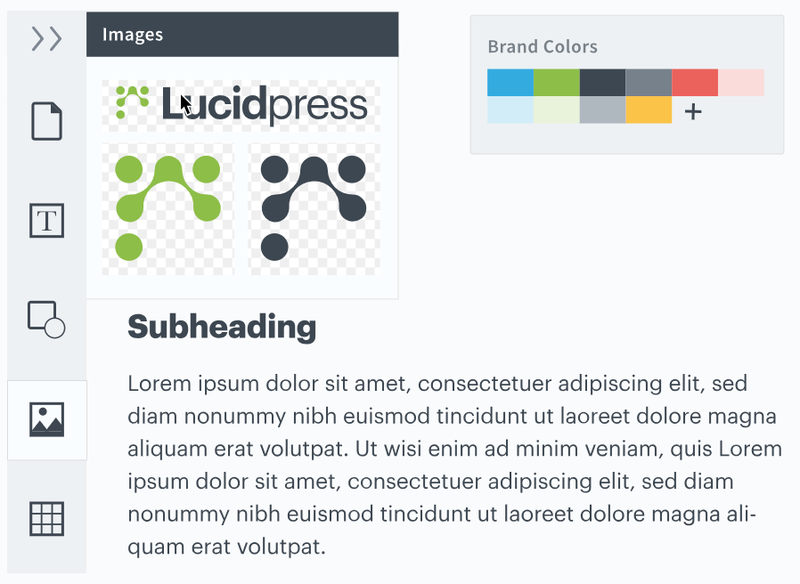 Store and organize all of your brand assets in the Lucidpress brand asset manager. Use the quick search bar to quickly find the asset you’re looking for. When new team members request access to the brand portal, simply set them up with an account within your organization, and they will immediately be able to access all of your brand files, and start creating content the same today. 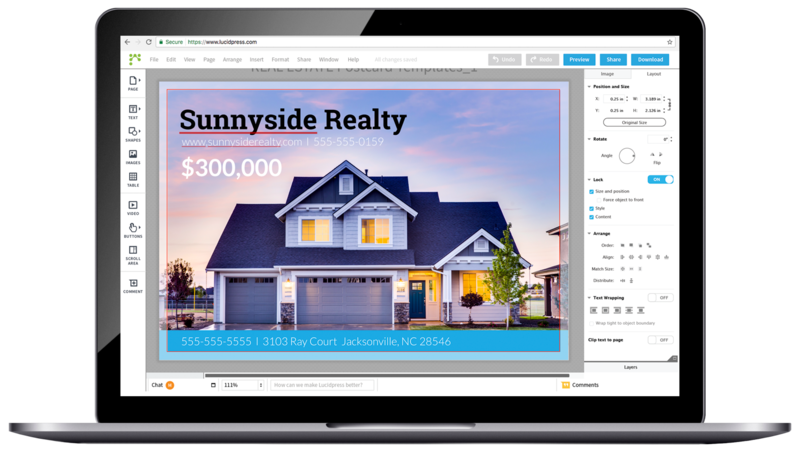 Unlike other brand portals and digital asset management systems, Lucidpress does much more than simply store your assets and document your brand style guide. 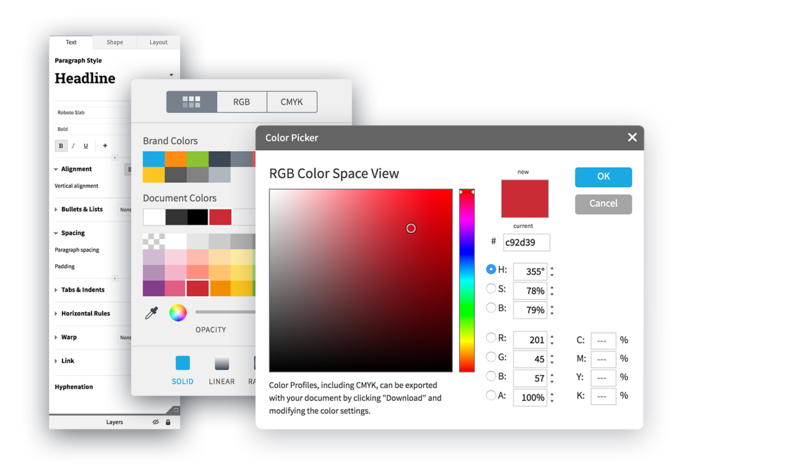 Use the brand portal to add brand colors, fonts, default styles and even smart fields, so users can only use those set colors and styles as they create and edit content within Lucidpress. Lucidpress's brand portal is more than just a lockable design tool. It's a powerhouse of robust features that streamline your design and distribution processes, keeping you and your team focused on growing your brand instead of managing it. Customize your brand portal to your organization's needs. Adjust what templates are available to customize, and set user permissions and passwords where necessary. Customize which users have access to what. Give your brand team admin access to control and update the brand assets while restricting other users’ access or requiring an approval process. Simply login and go from anywhere in the world--no downloads or upgrades required. Your brand assets will travel with your employees as they work-from-home or travel the world. Streamline the creation process by pre-populating templates with imported data. Take advantage of smart fields for frequently-used information, such as name or address. 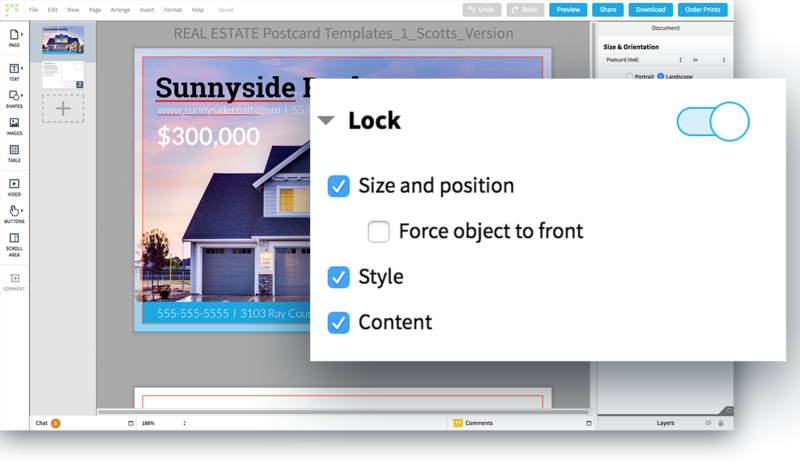 Lucidpress offers an intuitive UI with simple drag-and-drop functionality. Most users will be able to get started with little to no training. Use our multiple integrations to quickly share content via email or social media. Our brand portal business solution comes with the support of a Lucidpress expert to be your point of contact for any questions you company has and keep your account running smooth. Give your corporate marketing team some breathing room. Brand portals empower non-designers within your organization to create and customize beautifully branded content all on their own. 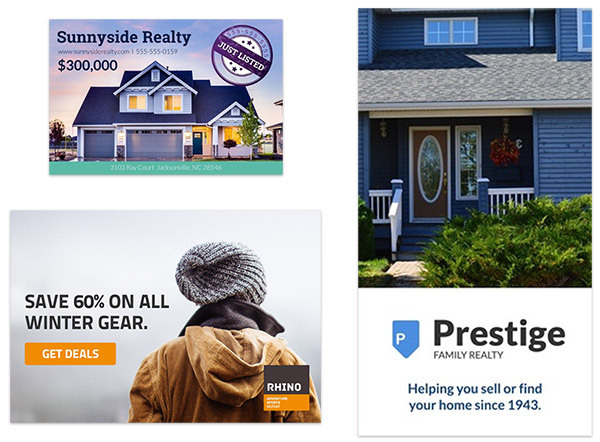 Lucidpress users can create anything from flyers and brochures to direct mail campaigns and social media posts on our intuitive drag-and-drop editor. Now you can allow anyone to create marketing content freely... but only on your brand's terms. Lock down your logo, colors, font styles, and even placement on Lucidpress's lockable templates. Set approval workflows to guarantee print and digital assets look just how they should before being used externally. Scale your brand with the Lucidpress brand portal. Explore our vast library of professionally designed templates, or create your own branded template from scratch. You can even upload your existing Adobe InDesign files and convert them into Lucidpress templates. 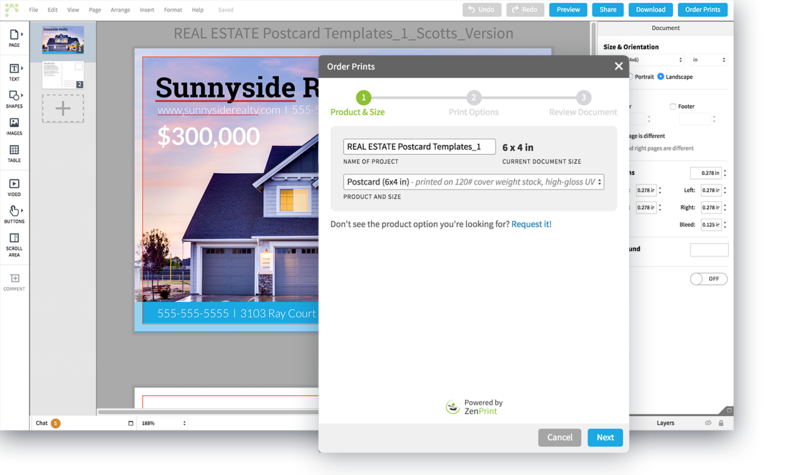 Create anything from business cards to sales proposals to social media posts (the list goes on) on our cloud-based editor. Once your template is designed, lock down branded elements to ensure they aren't accidentally changed by other users. They'll only be able to customize the areas of the templates you determine. Let your organization's users collaborate on their designs in real time (without accidentally messing with the brand). They'll be able to pull brand images, colors, fonts, logos, and more from the brand asset manager. Toggle the Lucidpress Review & Approve feature on and off for added control. Members of your organization can publish digital copies of their documents, share them directly to social media, order prints and even deliver direct mail. This can all be done straight from the Lucidpress brand portal. See the Lucidpress brand portal in action.